In order for children to have the chance to learn the nyckelharpa, there is a need for smaller nyckelharpas. This was the catalyst for The Children’s Nyckelharpa Project (Barnnyckelharpor), coordinated by ESI during 2009-2010. 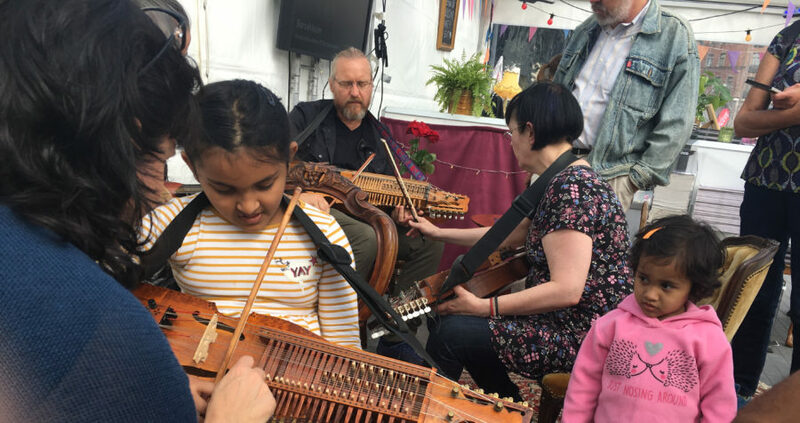 The purpose of the project was to build 25 child-sized nyckelharpas that could be loaned to children at music and arts schools all over the country. ESI also funded the costs of the building materials, bows and instrument cases, and 4 weekend workshops at the institute. Because of this project, the Eric Sahlström Institute now has the possibility to enable children to try and take lessons on nyckelharpas that are appropriate for their size and stature. The Eric Sahlström Institute - ESI - is a Swedish national center for traditional music and dance, with the instrument nyckelharpa as our special endeavor. Through education, long-term projects and performances, we promote and develop the genre across the country and abroad. ESI is accredited to provide advisory services to UNESCO's Intergovernmental Committee for the Safeguarding of the Intangible Cultural Heritage.